1.5 oz (Classic Vegetable Stock) a classic vegetable stock reduced to a glace, is a wonderful addition to soups and sauces, rices and grain dishes. 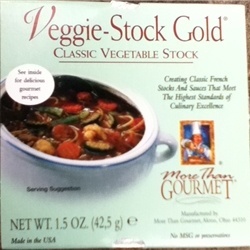 Veggie-Stock Gold presents a wonderful addition for your light dishes. A clear stock with no added starches or fat, Veggie-Stock Gold's blend of select fresh vegetables is a natural way to enhance the color and flavor of your current stocks or entrees.